Craniosynostosis and other craniofacial syndromes usually are the result of a birth defect that causes one or more connections in the skull to close prematurely affecting normal brain and skull growth. Craniofacial anomalies also can occur in adulthood as a result of trauma or tumors. Craniofacial anomalies diagnosed in childhood are generally treated by surgical intervention early in life. Adults with craniofacial problems that were diagnosed and repaired in childhood may have ongoing needs as a result of late complications from surgery or the need for further corrective surgeries. Trauma and tumors can lead to craniofacial abnormalities similar to those seen in children with craniosynostosis. Treatment typically involves surgical intervention, which could include multiple surgeries in a planned and staged fashion. 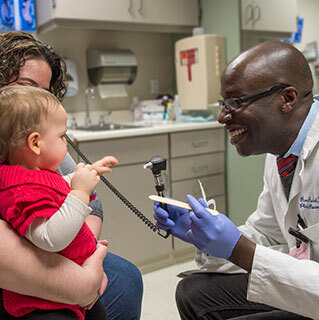 At University of Chicago Medicine, the transition from pediatric to adult care is seamless. Our craniofacial team includes neurosurgeons and plastic surgeons with advanced training in pediatric neurosurgery and craniofacial plastic surgery. This specialty trained team cares for both children and adults with these syndromes.